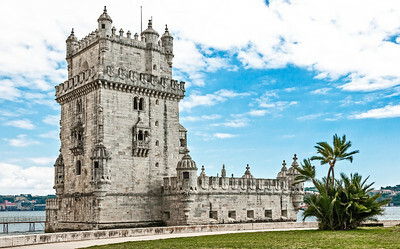 The Belem Tower or the Tower of St Vincent is a fortified tower located in the civil parish of Santa Maria de Belém. 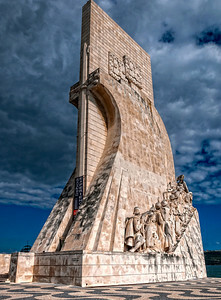 The tower was commissioned by King John II to be part of a defense system at the mouth of the Tagus river and a ceremonial gateway to Lisbon, Portugal. 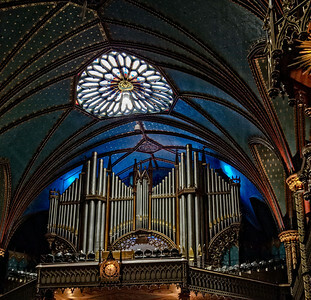 Notre-Dame Basilica (French: Basilique Notre-Dame de Montréal) is a basilica in the historic district of Old Montreal, in Montreal, Quebec, Canada. 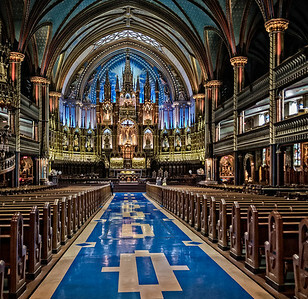 The church is located at 110 Notre-Dame Street West, at the corner of Saint Sulpice Street. 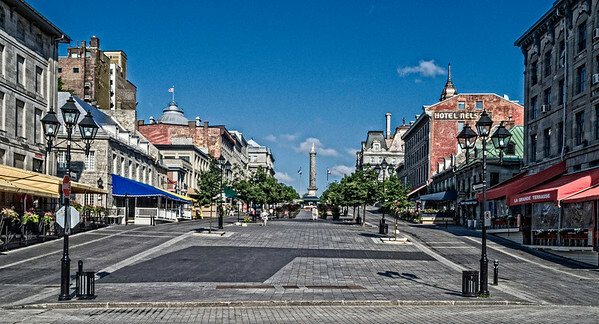 It is located next to the Saint-Sulpice Seminary and faces the Place d'Armes square. The church's Gothic Revival architecture is among the most dramatic in the world; its interior is grand and colourful, its ceiling is coloured deep blue and decorated with golden stars, and the rest of the sanctuary is a polychrome of blues, azures, reds, purples, silver, and gold. 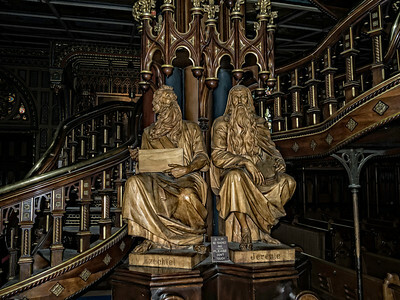 It is filled with hundreds of intricate wooden carvings and several religious statues. Unusual for a church, the stained glass windows along the walls of the sanctuary do not depict biblical scenes, but rather scenes from the religious history of Montreal. It also has a Casavant Frères pipe organ, dated 1891, which comprises four keyboards, 92 stops using electropneumatic action and an adjustable combination system, 7000 individual pipes and a pedal board. Nelson's Column is a monument erected in 1809 at Place Jacques-Cartier, Montreal, Quebec, Canada, dedicated to the honour of Admiral Horatio Nelson following his death at the Battle of Trafalgar. Since the destruction of Dublin's Nelson's Pillar (1808–1966), Montreal's stands as the oldest "Nelson's Column" in the world, and is also the city's oldest surviving monument. 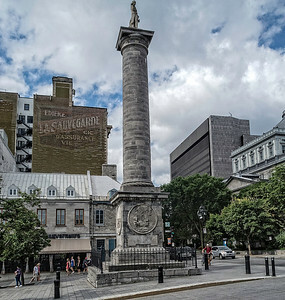 Neither the French Revolution nor Napoleon had been popular among the French in Montreal, and contrary to later belief, the public funds raised for the monument were collected from British and French Montrealers alike. During the French Revolution this became the site of the guillotine. 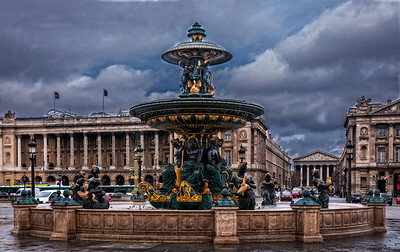 The square became the Palace de la Concorde in 1795. de la Concorde in 1795. 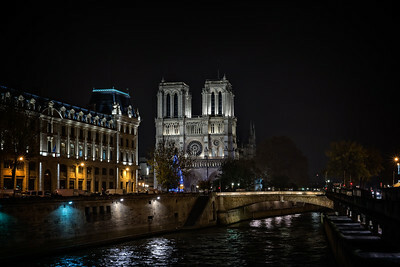 Notre-Dame de Paris (French for "Our Lady of Paris"), also known as Notre-Dame Cathedral or simply Notre-Dame, is a historic Roman Rite Catholic Marian cathedral on the eastern half of the Île de la Cité in the fourth arrondissement of Paris, France. 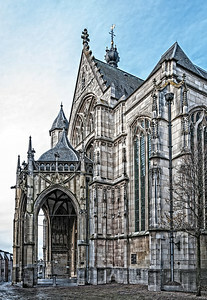 The cathedral is widely considered to be one of the finest examples of French Gothic architecture and among the largest and most well-known church buildings in the world. The naturalism of its sculptures and stained glass are in contrast with earlier Romanesque architecture. As the cathedral of the Archdiocese of Paris, Notre-Dame is the parish that contains the cathedra, or official chair, of the archbishop of Paris, currently Archbishop André Vingt-Trois. The cathedral treasury is notable for its reliquary which houses some of Catholicism's most important first-class relics including the purported Crown of Thorns, a fragment of the True Cross, and one of the Holy Nails. 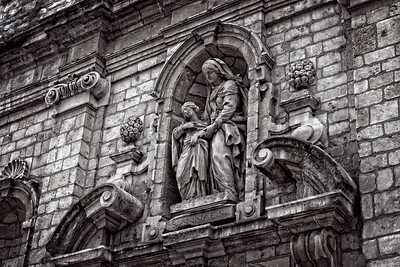 Paris, France In the 1790s, Notre-Dame suffered desecration during the radical phase of the French Revolution when much of its religious imagery was damaged or destroyed. An extensive restoration supervised by Eugène Viollet-le-Duc removed remaining decoration, returning the cathedral to its original Gothic state. 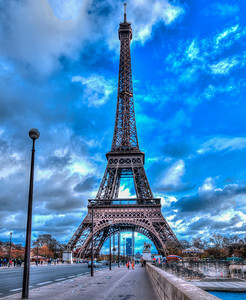 The Eiffel Tower was erected on the occasion of the World Fair 1889. The true symbol of Paris, France. 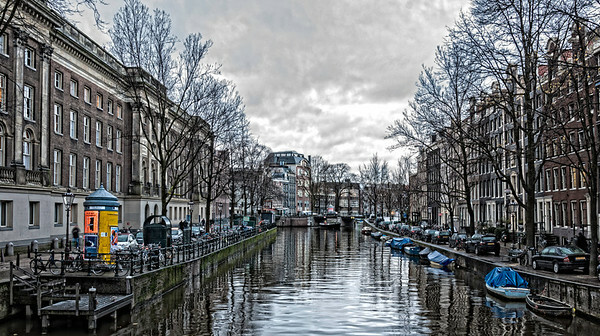 Keizersgracht (literal English translation: Emperor's Canal) is the second and widest of the three major canals in the city centre of Amsterdam, in between Herengracht and Prinsengracht. It is named after Maximilian I, Holy Roman Emperor. Lake Storey was constructed during the years of 1927 and 1929, by the Atchison, Topeka and Santa Fe Railway. 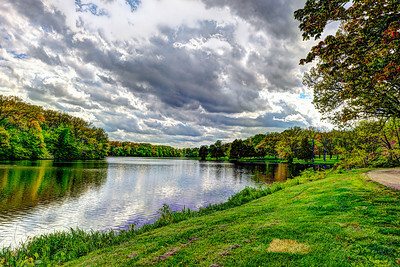 The lake was erected so that locomotives would have soft water to run through them, as the City Reservoir was considered too harsh for the boilers and pistons. 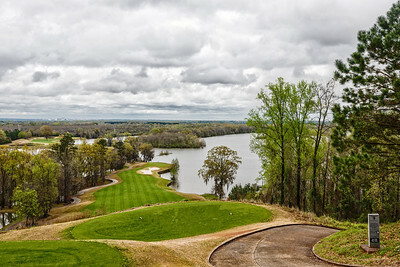 The Lake was originally named "Santa Fe" but later renamed "Lake Storey" for W.B. Storey, President of the Railway. In 1952 the Santa Fe Railway Company deeded the lake over to the City of Galesburg. 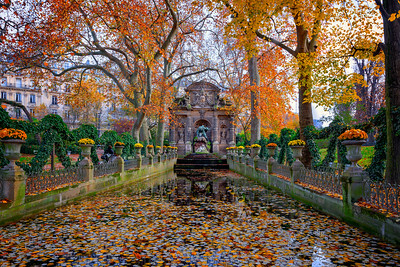 Medici Fountain in The Jardin du Luxembourg. 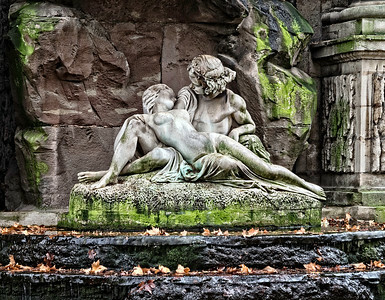 Polyphemus surprises Galatea with the shephard Acis. The Eiffel Tower is one of the most famous icons in the world and is located on the banks of the Seine River in Paris, France. This prominent structure is made out of iron and is built on Champ de Mars. The tower got its name from the engineer who built it and it is the tallest building in the entire city. 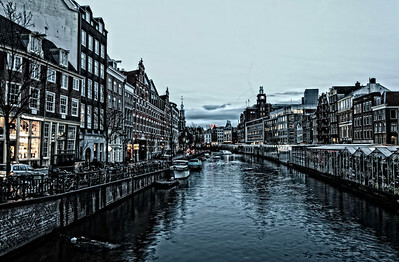 It is one of the few places in the world that is visited by more than 200,000,000 tourists since its construction in 1889 and it generates more revenue than any other monument in the world. 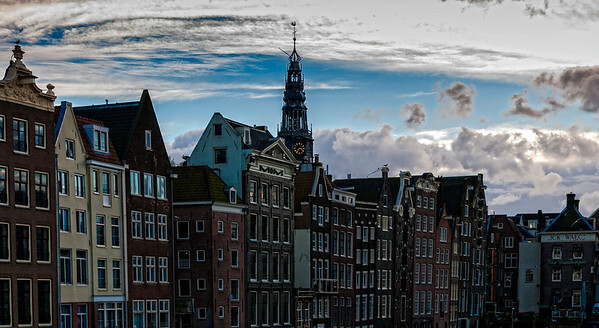 The tower was constructed in just three years and its initial purpose was to broadcast radio signals. It stands 1,063 feet high with a 79-foot antenna and weighs around 7,900 tons. 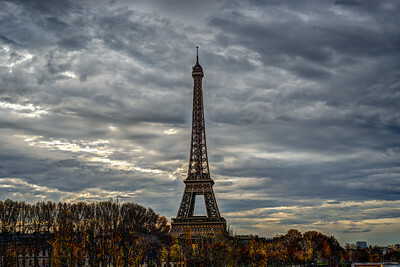 During the time the Eifel Tower was made, many people were surprised and shocked to see its daring and intrepid shape. The engineers who were making an effort to create it were accused of trying to do an experiment. But the engineers were sure and confident of what they had in mind. They also understood the forces of the wind and knew that the structure would support stand up to the gusts. Their persistence finally paid off in 1889 when the tower’s construction was completed and it stood tall as one of the largest structures in all of Paris. The tower has two restaurants located on the first floor. There is built-in lift that can take visitors to the top floor to witness the marvelous view of Paris, France. 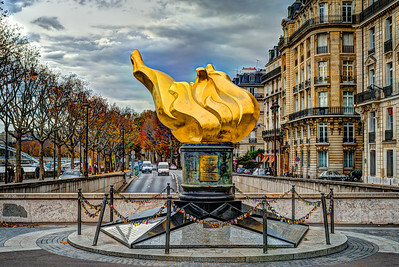 The Flame of Liberty (Flamme de la Liberté) in Paris is a full-sized, gold-leaf-covered replica of the new flame at the upper end of the torch carried in the hand of the Statue of Liberty at the entrance to the harbor of New York City since 1986. 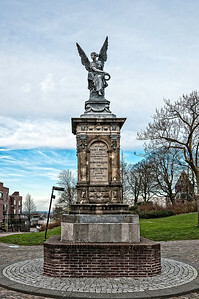 The monument, which measures approximately 3.5 metres in height, is a sculpture of a flame, executed in gilded copper, supported by a pedestal of gray-and-black marble. 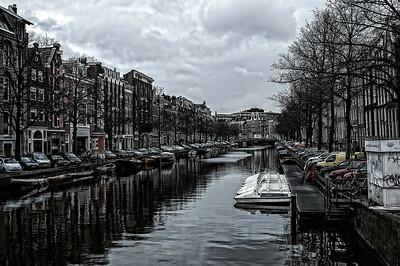 It is located near the northern end of the Pont de l'Alma, on the Place de l'Alma, in the 8th arrondissement of Paris. 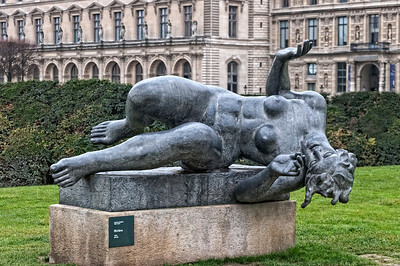 It was offered to the city of Paris in 1989 by the International Herald Tribune on behalf of donors who had contributed approximately $400,000 for its fabrication. It represented the culmination of that newspaper's 1987 celebration of its hundredth anniversary of publishing an English-language daily newspaper in Paris. More importantly, the Flame was a token of thanks for the restoration work on the Statue of Liberty accomplished three years earlier by two French businesses that did artisanal work on the project: namely, Métalliers Champenois, which did the bronze work, and the Gohard Studios, which applied the gold leaf. While the gift to France was prompted by the centennial of the newspaper, the Flame of Liberty, more broadly, is a lasting symbol of the friendship uniting the two countries, just as the statue itself was, when it was given to the United States by France. This project was overseen by the director of the French craft unions at that time, Jacques Graindorge. He foresaw an installation of the Flame of Liberty in a public square called Place des États-Unis (United States Place) in the 16th arrondissement, but the mayor of Paris at the time, Jacques Chirac, was opposed to it. 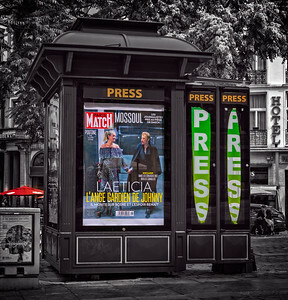 After a protracted period of negotiations, it was decided that the Flame would be placed in an open area near the intersection of l'Avenue de New-York (New York Avenue) and the Place de l'Alma. The monument was dedicated on May 10, 1989 by Chirac. On the base of the monument, a commemorative plaque recounts the following story: "The Flame of Liberty. An exact replica of the Statue of Liberty's flame offered to the people of France by donors throughout the world as a symbol of the Franco-American friendship. On the occasion of the centennial of the International Herald Tribune. Paris 1887-1987." The flame became an unofficial memorial for Diana, Princess of Wales after her 1997 death in the tunnel beneath the Pont de l'Alma. The flame became an attraction for tourists and followers of Diana, who fly-posted the base with commemorative material. Anthropologist Guy Lesoeurs said, "Most people who come here think this was built for her." The site of the monument is served by the Métro de Paris subway station called Alma-Marceau on Line No. 9 and by the RER commuter rail station, Pont de l'Alma, on its 'C' Line, as well as by buses numbered 42, 63, 72, 80, 92, and the Balabus sightseeing buses. A new Flame of Liberty, a sculpture by Jean Cardot, was unveiled on June 14, 2008. 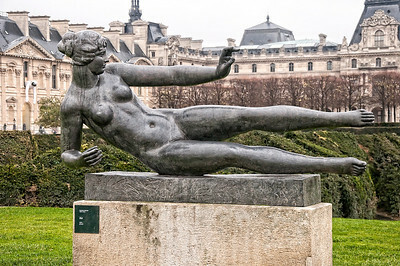 It symbolizes the warm and respectful relations between the French and the Americans. It was installed in the gardens of the United States Embassy to France in the Place de la Concorde, and it was dedicated in the presence of the President of the French Republic, Nicolas Sarkozy, and George W. Bush. 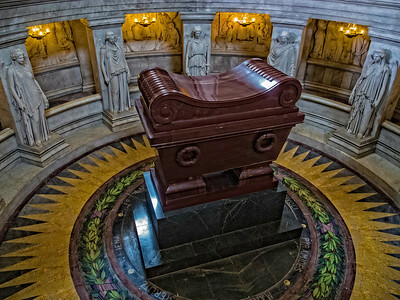 This new flame is the embodiment of an impulse shared by French businessman, Marc Ladreit de Lacharrière, and the American ambassador, Craig Roberts Stapleton, and it displays two inscriptions, one by the Frenchman, the Marquis de Lafayette, and another by the American statesman, Benjamin Franklin. The 800-year-old cathedral is located on an isle, the Ile de la Cite. Notre Dame Cathedral was built by Maurice de Sully, bishop of Paris. Construction commenced in 1163, during the reign of King Louis VII, and was completed around 1345, a time when Paris had come into its own as a hub for commerce & center of politics. Constructed in an era when illiteracy was the norm rather than the exception, the cathedral features Biblical stories in its portals, paintings, and stained glass design. 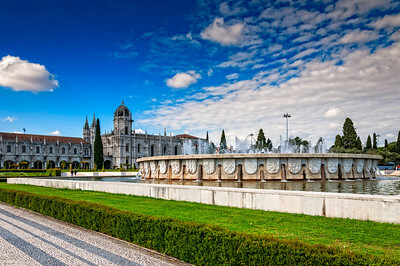 The cathedral is characterized by ornately crafted spires and other notable features of early Gothic architecture. Among the momentous moments that have taken place at the cathedral was the crowning of Henry VI as king of France in 1431, and also of Napoleon (as emperor) in 1804, not to mention weddings of historical figures. Crusaders knelt to pray at the cathedral before setting off on their journey and engaging in holy wars. Revolutionaries ransacked and defaced the magnificent place of worship. 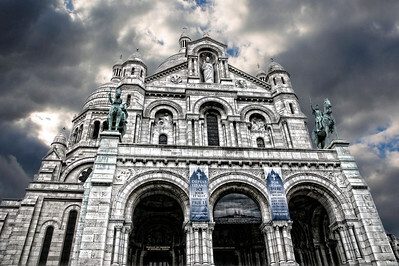 Notre Dame Cathedral has been pillaged, restored, and has undergone numerous facelifts. 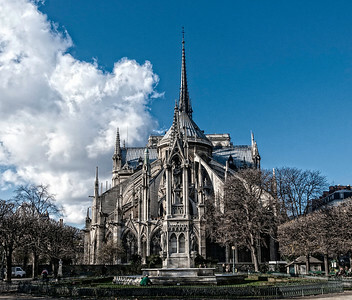 Today, it is both the art and architecture of the Notre Dame Cathedral that mesmerize visitors. The west front has 28 statues that represent Judaea’s and Israel’s monarchs. One will find the famed bell called Emmanuel at the south tower. The legendary guardians – gargoyles that were a fitting addition to the Gothic cathedral as part of restorative work during the 19th century – are on the Grand Gallery. Rose windows of stained glass, a hallmark of Gothic architecture, may not be as extraordinary as other cathedrals in France, but they nonetheless make a spectacular sight. Many historical artifacts, like a 17th century organ, may be seen inside the Notre Dame Cathedral. Located in the 5th arrondissement at 6 Place Paul-Painlevé, south of the Boulevard Saint-Germain, between the Boulevard Saint-Michel and the Rue Saint-Jacques. The structure is perhaps the most outstanding example still extant of civic architecture in medieval Paris. It was formerly the town house (hôtel) of the abbots of Cluny, started in 1334. The structure was rebuilt by Jacques d'Amboise, abbot in commendam of Cluny 1485-1510; it combines Gothic and Renaissance elements. 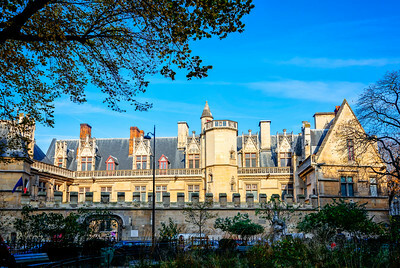 In 1843, it was made into a public museum, to hold relics of France's Gothic past preserved in the building by Alexandre du Sommerard. The Wormsloe Historic Site, informally known as Wormsloe Plantation, is a state historic site near Savannah, Georgia, in the southeastern United States. 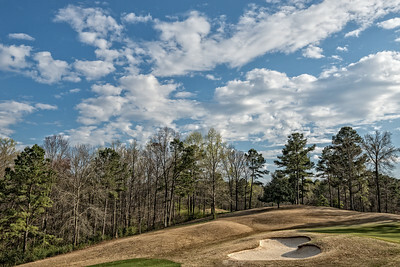 The site consists of 822 acres (3.33 km2) protecting part of what was once the Wormsloe Plantation, a large estate established by one of Georgia's colonial founders, Noble Jones (c. 1700-1775). 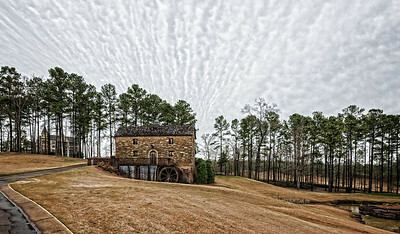 The site includes a picturesque 1.5-mile (2.4 km) oak avenue, the ruins of Jones' fortified house built of tabby, a museum, and a demonstration area interpreting colonial daily life. In 1736, Noble Jones obtained a grant for 500 acres (2.0 km2) of land on the Isle of Hope that would form the core of Wormsloe. He constructed a fortified house on the southeastern tip of the island overlooking the Skidaway Narrows, a strategic section of the Skidaway River located along the intracoastal waterway roughly halfway between downtown Savannah and the Atlantic Ocean. 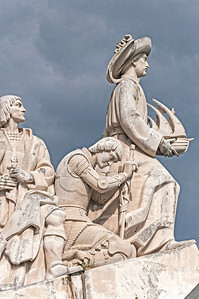 The fortified house was part of a network of defensive structures established by James Oglethorpe, founder of Georgia, and early Georgia colonists to protect Savannah from a potential Spanish invasion. Jones subsequently developed Wormsloe into a small plantation, and his descendants built a large mansion at the site which they used as a country residence. 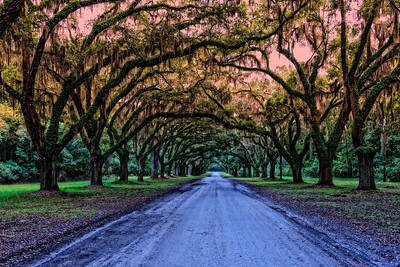 The State of Georgia acquired the bulk of the Wormsloe Plantation in 1973 and opened it to the public as a state historic site in 1979. Charles François Gommaire Buls was born in Brussels as the son of a goldsmith from the region of Mechelen. Buls received an artistic education, and spent a year in Paris, and nine months in Italy, studying fine arts. 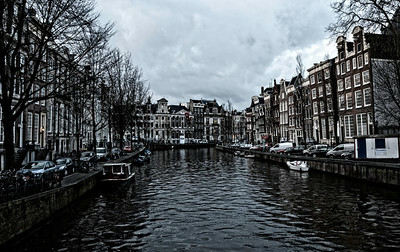 He also learned several languages including English, German, Italian and Latin, besides his mother tongue Dutch. He followed in his father's footsteps and worked as a goldsmith. In 1862 he became a Freemason in "Les vrais amis", and in 1871 joined "La libre pensée". 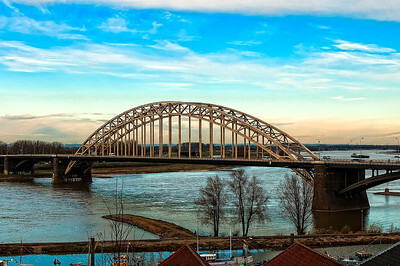 At the same time, he was a member of "de Veldbloem" and "Vlamingen vooruit", two Flemish organisations of the Flemish movement. Together with his brother in law, Leo Van der Kindere, the later mayor of Uccle, he became a "flamingant". Buls entered politics in 1870 as a Flemish candidate on a radical list but he was not elected until 1877, when he was elected to the Brussels city council on a liberal list. He became schepen or échevin of education in 1879. Buls was a supporter of progressive causes, especially in language issues and education, and the education of women, on which he wrote frequently. He was a supporter of Isabelle Gatti de Gamond's educational reforms. From 1879 on he played an important role in the development of Flemish education in Brussels. On the national stage, Buls served in the Belgian Chamber of Representatives in 1882, and again from 1886 to 1894. Buls became Mayor of Brussels in 1881 and remained in office until 1899. At his initiative policemen had to be able to speak both French and Dutch and bilingual signposting was established throughout the city. 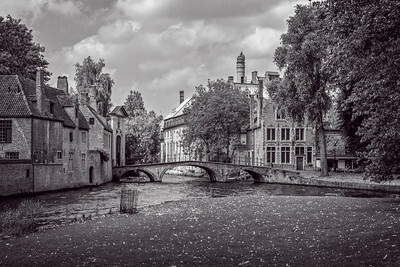 However, along with these reforms, his most lasting achievement was the result of his opposition to the grandiose architectural schemes of King Leopold II, and the resulting preservation of old parts of Brussels. 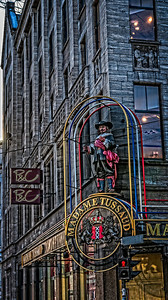 In particular, Buls was a steadfast defender and admirer of the Mont des Arts and the Grand Place, now a UNESCO World Heritage site, successfully proposing the 1883 city ordinance protecting the façades of the Grand Place buildings and providing funds for their restoration which took place between 1883 and 1923. In 1899, the architects of Brussels who had been involved in this restoration work paid for a memorial commemorating Buls, designed by Victor Horta and executed by Victor Rousseau, to be placed in the rebuilt "L'Etoile" or "De Ster" house on the Grand-Place. 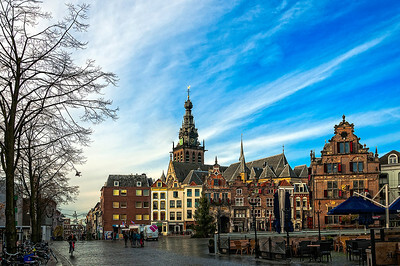 At the reopening of the restored Town Hall, Buls greeted Leopold II in Dutch, and the King replied in the same language, which was unusual at the time. 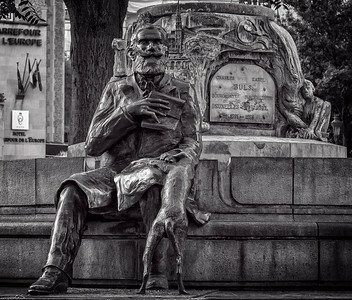 In 1999, a new fountain with a larger-than-life-sized seated statue of Buls and his dog was erected at the Place Agoraplein, close to the Grand Place. Buls was an accomplished and prolific author, not merely on educational and artistic issues but also publishing accounts of his travels abroad. Chicago’s Morton Salt warehouse to become riverfront office and entertainment complex. Located at 1357 N. Elston Avenue between the Kennedy Expressway and the Chicago River, the former warehouse ceased operations in 2015. 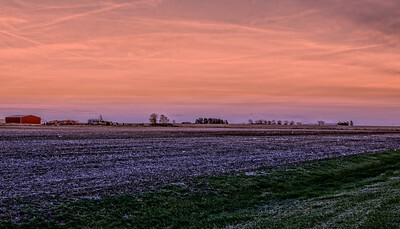 Its planned repositioning into the so-called ‘Salt District’ represents the latest property to take advantage of a recent zoning ordinance opening the majority of the 760-acre North Branch Corridor to new, non-industrial use.